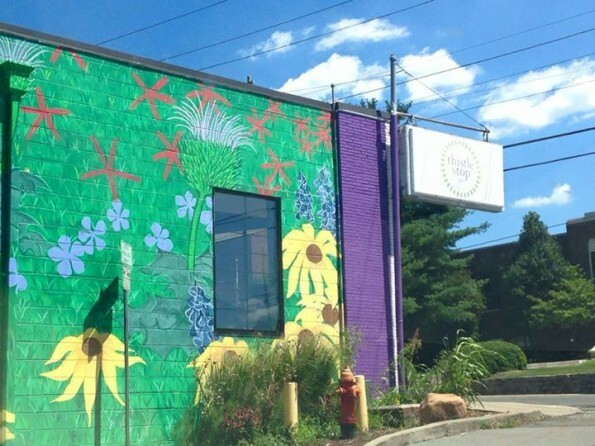 This mural was created by Mark Palen in 2014 and is situated on the wall of Thistle Farms Cafe, which is part of an organisation that helps survivors of human trafficking. Thistle Farms' mission is to Heal, Empower and Employ. They provide safe housing, economic independence and a strong community of advocates and survivors. A two-year residential program called the Magdalene Residential Programin Nashville, Tennessee provides housing, medical care, education and training for jobs for up to 32 women. Residents and graduates of this program are employed in on of their social enterprises including Thistle Farms Cafe, which sells sells body/home products that are made by these survivors. The organisation was founded by Becca Stevens in 1997 when she provided shelter for five women who had experienced trafficking, violence and addiction. Thistle Farms has helped many women over 20 years and they employ more than 1,800 women worldwide, with more than 40 sister communities.